Your emails are starting to fall on deaf ears; the quality and ROI of your PPC campaigns are on the decline; and your prospects and customers are spending more and more time online, but not necessarily on your site. Social media can address all of these issues in a measurable, programmable way by taking the brand experience. Bob has been marketing in the technology industry for 25 years, working for brands such as Oracle, NCR and SAS. For the past 3 years, Bob has run the Corporate Marketing and Digital Engagement at Alterian. 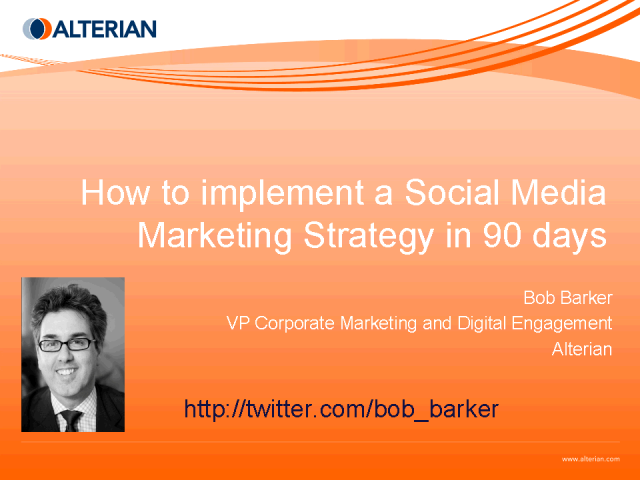 Bob is responsible for Alterian’s own Social Media strategy and implementation as well as being on the marketing team for Alterian’s Social Media Monitoring tool SM2 and Social Media Engagement Solutions.